Genealogist Lynn Serafinn explains why DNA tests alone cannot tell us everything about our ancestry. Article 2 of 4 of ‘DNA Tests, Genealogy, Ethnicity and Cultural Identity’. This article series has been written in response to the hundreds of questions and comments I have personally received or read on social media around the matter of DNA tests. More specifically, it is a response to the many discussions – often impassioned and angry – about recent changes in AncestryDNA’s algorithms, which caused many people to receive ethnicity reports that made no sense to them, and were at odds with what they knew and/or believed about themselves. As this is a complex subject, I decided to break it into FOUR articles (I originally thought I could do it in three, but in writing this instalment, I realised four were necessary). TOPIC 2: Entry Level Genetics for Genealogists and Family Historians, in which we looked at the different kinds of DNA tests and why it is essential to know what you want to gain before deciding to do one. We also examined how autosomal DNA is passed down through the generations and introduced the concepts of ‘endogamy’ and ‘pedigree collapses’. In this article, we will examine some of the misconceptions people have about DNA tests, how relationship estimates are formed to identify ‘DNA Matches’, and the many the challenges around identifying your connections with DNA matches. We’ll also look at the technique of ‘triangulation’, as well as how ‘endogamy’ can sometimes blur relationship estimates. 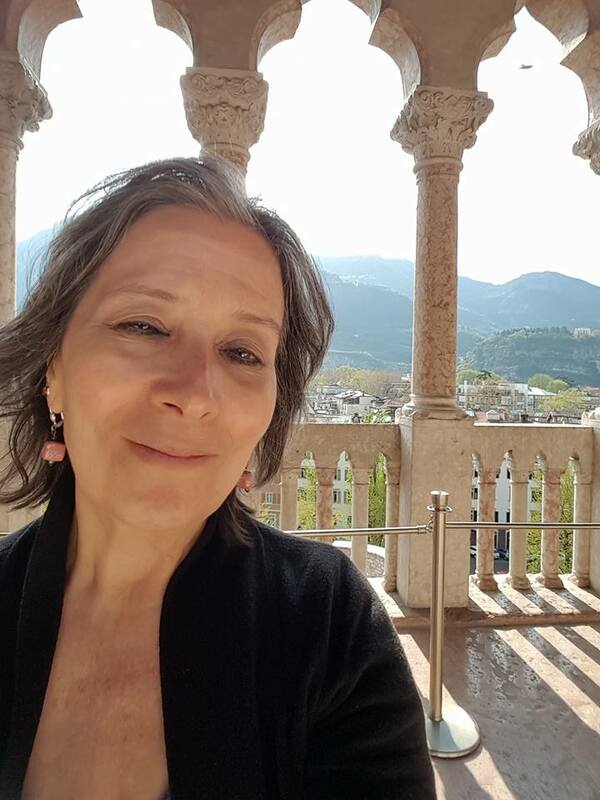 NOTE: Be sure to subscribe to the Trentino Genealogy blog using the subscription form at the right so you can receive Articles 3 and 4 in the special series on DNA testing. After the series is complete, I will also be compiling all these articles into a FREE downloadable PDF available for a limited time to all subscribers. If you are viewing on a mobile device and cannot see the form, you can subscribe by sending a blank email to trentinogenealogy@getresponse.net. DISCLAIMER. 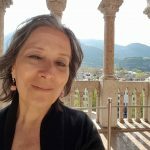 Once again, as you read this article series, I ask you to remember that I am a genealogist, not a scientist or academic historian. All opinions and observations are based on my own research both personally and within the context of my professional experience in genealogy. Earlier this week I was in a computer repair shop returning a refurbished unit that was defective (I ended up having to buy a new computer, which I am using now). During my conversation with the shop owner – who was of southern Italian descent (Puglia) – I described some of the genealogy software programs I use, so I could illustrate why the computer wasn’t working properly. ‘I just want to know my ancestry,’ he said. I explained to him that these are all very different objectives, and that DNA testing might shed light on some of them, but not all – and not consistently from company to company. After making a few more enquiries, I learned he knew little about his own Puglian ancestors and had never done any kind of research to find them. Based on what he had seen in the media, he had formed a belief that DNA testing was the key to unlocking all these mysteries. But he is not alone in thinking this. In my experience, most people who are new to the idea of DNA testing seem to have developed similar misconceptions, largely based on misleading suggestions (which verge on promises) in advertising and television programmes. In fact, many people I meet also have the impression that ‘science’ (i.e. DNA testing) can give them answers to genealogical questions, i.e. names and details about specific ancestors. But barring a few exceptions, which we’ll look at shortly, this simply isn’t true. One group of people for whom DNA testing has proven to be a godsend is adoptees. We see many heart-warming success stories in the media where DNA testing has helped to adopted children, parents and/or siblings to find each other. And for these kinds of close biological relationships, DNA testing can be extremely effective. As we discussed in Article 1, parents and their children share 50% of their DNA, and full siblings can also share up to 50% of their DNA. Half-siblings share roughly half the amount of DNA as full siblings, i.e. up to 25%. When it comes to DNA, these percentages are extremely high and there would be no mistaking such a relationship if it popped up in a database (unless the family were severely inbred, such as in the case of the royal Hapsburg family*, wherein the inherited DNA of Charles II was actually MORE ‘collapsed’ than if his parents had been brother and sister). All these close relationships – probably up to 2nd cousins – are fairly easy to identify using DNA tests. But there is one important condition without which none of this would be possible: BOTH parties need to have done a DNA test through the SAME testing provider. And therein lies the fly in the ointment. When we are seeking to connect (or reconnect) with close family, no DNA test can help us unless the other party (or someone closely related to that person) has their DNA in the same database as ours. And if that isn’t the case, the only alternative we have is to use traditional ‘paper trail’ genealogical research. * The genetic history of the Hapsburgs is discussed in detail in Chapter 3 of A Brief History of Everyone Who Ever Lived by Adam Rutherford. When we take an autosomal DNA test from one of the big companies, our results will be added to their database and compared with other test takers. From these comparisons, we will receive a list of ‘DNA Matches’ or ‘DNA Relatives’, depending on which company you use. Next to each person on the list you will see an estimated relationship, derived from the number of ‘centimorgans’ (cM) shared between you. What is most striking about this table is how the variability in cMs increases as your relationships get more distant. A parents/child relationship is a fixed number while full siblings have a slight variability of about 7-8%. But once you get to grandparents, uncles, aunts and half-siblings that variability LEAPS up to 30-40%. And then, when you get to 2nd cousins and beyond, the statistical variability is actually greater than the number of cMs they are likely to share. 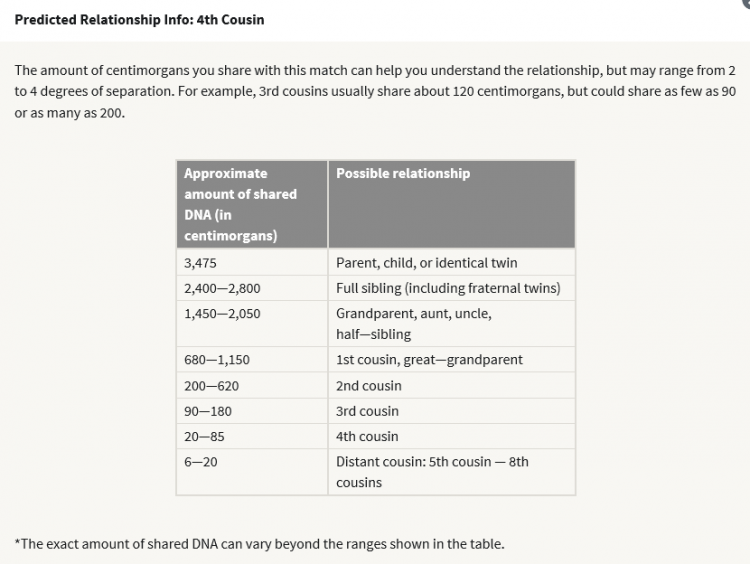 Ancestry has even put a disclaimer at the bottom of the table saying the exact amount of shared DNA can go beyond the ranges shown in the table. The primary reason for these variables is that siblings (except identical twins) do not inherit exactly the same genes from their parents (as we explored in Article 1). Thus, specifying how much genetic information blood relatives will share becomes less predictable and more ‘mixed’ as you move through the generations. But another reason for these inevitable variables is ‘pedigree collapse’ (also discussed in Article 1); I’ll come back to this point in a few minutes. DNA Relatives – And THEN What? Knowing these variables, you can probably get an idea of the challenges of trying to piece together your family through DNA alone. If your DNA results are like mine, the majority of these ‘matches’ will be distant relatives, i.e. 4th to 6th cousins or sometimes more distant, depending on which company you use. I have hundreds of ‘DNA matches’ on the four sites where my data appears. Every now and then, someone amongst them ‘pops out’ on the list to me, and I feel pretty confident I can connect them to my already extensive tree. Just this morning, in fact, I was able to confirm two new DNA matches as 4th cousins by comparing their genealogical info to my own. The whole process took me only a few minutes, as I already had their ancestors in my personal database. This could never have been possible but for the fact that my research extends well beyond my own pedigree, as I have been transcribing the records for an entire parish for the past few years. Unfortunately, discovering the link between yourself and a DNA match is rarely a quick or easy process. I cannot COUNT the number of times one of my matches contacted me because I have a large family tree and expected me to be able to tell them about their ancestry, when they have done little (or NO) research of their own. Many of these people have no family tree, or one that is so minimal as to be of no practical help to finding a connection. While, of course, I feel for these people, it is also frustrating for me to have to explain to them that DNA cannot fill in the blanks without at least having tried to construct a tree – or hiring a genealogist to do the research for them. And even if I do manage to figure out how that person is related to me by blood, DNA is not the tool that will help me solve that puzzle – genealogy is. Again, I feel this kind of expectation is down to misleading advertising and media representation, wherein DNA is touted as ‘the answer’ to our ancestral mysteries. And given the number of times a year I have to explain this to my DNA matches, I think it’s a BIG ethical issue. DNA testing can point you in a DIRECTION. GENEALOGY is the ONLY way. SIDE NOTE: AncestryDNA used to show ‘distant cousins’, such as those predicted at 5th to 8th cousin level, but they discontinued this deeming these relationships to be ‘not useful’ and too uncertain. Ironically, I have ‘lost’ some DNA connections to some Trentino 6th and 7th cousins I KNOW personally because we are all avid genealogical researchers. I feel Ancestry should have allowed its users to choose whether they wished to retain all that old information, rather than just wiping the slate clean for us. I’d like to return to the idea of ‘endogamy’ and ‘pedigree collapses’, in which some of our ancestors may be related to us via more than one line (refer back to Article 1 for a detailed explanation of these concepts). If you were indeed 4th cousins, it means you share 3X great-grandparents. Each of you has a possible 32 great-great-great-grandparents – 64 between you – and only one pair (or possibly only one PERSON) of these is common to you both. If both of you have done enough genealogical research to trace ancestry back to those 3X great-grandparents, finding the link between you will be relatively straightforward. But what if endogamy is blurring the estimate? In other words, what if there were many pedigree collapses in both of your trees? Pedigree collapses are common to all of us, but when they occur repeatedly in subsequent generations, your DNA becomes less varied than if it were ‘new’ every generation. This can sometimes cause predicted relationships to be estimated as being closer than they really are. For example, back when Ancestry used to show more distant DNA relations, it predicted one of my matches was likely to be my 5th cousin. But when we did the genealogical research to find our connection, we discovered we were actually 6th and 7th cousins – via multiple lines. This was all down to pedigree collapses in both of our trees. This would mean you share a pair of 5X great-grandparents (or at least one 5X great-grandparent, if a husband/wife died and the widower/widow remarried). Each of you has a maximum of 128 5X great-grandparents – as many as 256 between you (128 pairs). I say ‘a maximum’ because there could (and most likely ARE) fewer, due to pedigree collapses. Possibly only ONE of these 128 pairs – or possibly only one PERSON – is common to you both. Depending on your age and the ages at which your ancestors had children, your 5X great-grandparents may have been born any time between 1670-1750. Now, the question is this: have BOTH you and your DNA match traced your pedigree back that far through genealogical research? If not, unless one of you has traced your ancestors FORWARD in time (i.e. traces all of their descendants, even if they are not their own direct family), you are unlikely to make anything more than an educated guess as to how you are connected. Again, DNA testing can make predictions, but even these predictions can be OFF. They cannot tell you how many times your pedigree has collapsed and at what points in your ancestry they occurred. The only methodology that can tell you these things is genealogy. One method many DNA enthusiasts use to try to establish connections between them is ‘triangulation’. This is where you compare cMs that are shared by three or more people, to see if you can discover the common ancestor. If you wish to try out triangulation, 23AndMe has a DNA comparison tool that allows you to compare a group of up to five DNA matches; GEDMatch also has a tool where you can compare the data from multiple DNA kits. NOTE: Before I continue, I will tell you that I am 50% Trentini/Veronesi via my dad and 50% Irish via my mom. The reason why this is important to know will become apparent in a minute. About five years ago, when I was new to DNA testing, all of us in this ‘Chromosome 16 group’ were trying to figure out what this triangulation could tell us. Many of us had Irish surnames in our recent history (i.e. great-grandparents), so we assumed our connection was probably via Ireland. Unfortunately, at that time, few of us in the group had done enough research on our Irish sides to find the common ancestor, who was probably born around 1800 or slightly earlier. Again, the answer to the riddle of how we are related lay in genealogy, but none of us had yet found the documentation to prove anything. I kind of ‘parked’ that whole ‘Chromosome 16’ experiment for some time. But then, one day, I decided to run the test again, adding someone ELSE to the test group: one of my 1st cousins on my TRENTINO side. My 1st cousin (represented by the big green segment above) appears to share the same segment of Chromosome 16 as our Ch16 group. I was baffled. Could we have gotten it wrong all these years? Were we NOT related by Irish ancestry after all, but rather by a common Trentino ancestor? It seemed really unlikely, but the image seemed to imply it. I say ‘seemed’ because it turns out I was completely WRONG. What I hadn’t actually DONE was create a ‘triangle’. Yes, I compared how all these people were related to me; but I hadn’t examined if or how these people might be related to each other. That is the crux of what ‘triangulation’ is. I already knew all the people in the Ch16 group had been triangulated against each other, and that they were all DNA Matches. But when I compared my Trentino cousin with each individual in the Ch16 group, he shared ZERO DNA with them. So how can it be that my cousin shares nearly all of my 16th chromosome with me, but shares no definable DNA with anyone in the Ch16 group? What the chart from 23AndMe above does not show is that every chromosome in your bodies has TWO strands. That’s why you sometimes hear of DNA referred to as ‘the double helix’. We inherit one strand from our father and one from our mother. If my Trentino cousin and I share nearly all of the same DNA on Chromosome 16, and all the other DNA Matches share Ch16 with me but NOT with him, it means my Trentino cousin and the Ch16 group are on different halves of the same chromosome. In other words, the DNA I share with my Trentino cousin comes from a DIFFERENT parent from the DNA I share with the Ch16 group. And as I know my Trentino cousin is not a blood relation of my Irish mother, this became (to me anyway) ironclad proof that those of us in the Ch16 group WERE connected via a common Irish ancestor after all. So, actually, adding my Trentino cousin to the mix was a way to exclude any alternative theories. As of this writing, our Ch16 group has not made any big breakthroughs in discovering WHO our common Irish ancestor is, although one of the members is trying to find a birth record for one of my Irish 3X great-grandmothers. Maybe we’ll break through that brick wall this time. You can be related to someone and NOT show up as DNA Matches in DNA test websites. NOTE: I’m not implying my 1st cousin is related to my Ch16 group; there is nothing to indicate he is. 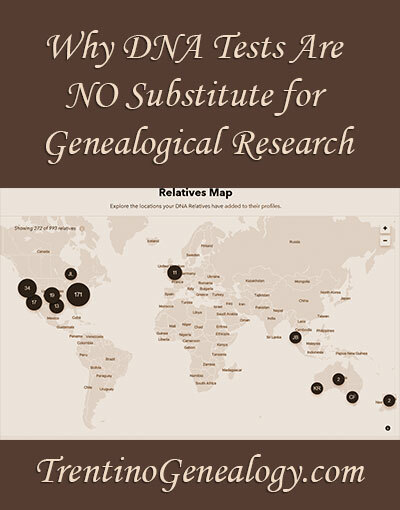 I am talking about people who share a known genealogical connection, but who do not show up as matches on DNA testing databases. The randomness with which we all inherit DNA from our ancestors does NOT mean we will all inherit the same genetic material, even if we KNOW we are related. Of course, the more closely we are related, the more likely common cMs will show up in our test results. Conversely, the more distantly we are related, the more likely DNA tests will either miss or filter out shared DNA we inherited from our common ancestors. I have had this happen with numerous known relatives – mostly at the level of 6th cousins (also bearing in mind that AncestryDNA no longer delivers matches at this level). I know of at least three people to whom I am related as 6th cousins – many of them connected to me in more way than one – and we don’t show up as DNA matches. Whether we don’t actually share any DNA, or the DNA we do share is beyond the current abilities of DNA testing technology, I cannot say. All I know is that we have all done exhaustive, well-documented genealogical research (we often help each other, in fact), and we are 100% certain of our blood connections. Yes, it would be nice to see a DNA test confirming this, but I am really not concerned. We know we are cousins, and that is all that matters. Of course, I smiled a LOT when I received this. But apart from being very kind words, they also contain some important insight into the nature of genealogy, and how it challenges our modern way of thinking. Genealogy DOES require incredible patience. It DOES require fine attention to detail, and an obsessive passion for solving puzzles. It requires you to be able to hold a great deal of information in your head, and to make connections between those pieces of information – sometimes years after you’ve recorded it. This kind of thinking truly is in sharp contrast to our modern ‘I want it now’ mentality, where 80% of people click away from a website if it takes more than a few seconds to load. DNA testing companies KNOW THIS about us. They KNOW we are impatient. They KNOW we ‘want it all – now’. They KNOW we want to get stuff, make money, lose weight or whatever with the least effort possible. And they also KNOW our society, especially those who have lost connection with their blood relations and/or ancestral homelands, suffers from an endemic identity crisis and are searching for ways to heal it – NOW. And that is how they reel so many of us in. While much of that article will give special attention to people of Trentino and/or northern Italian ancestry, I invite you to read it even if you have no such ancestry in your own tree, as it might give you some ideas about your own beliefs and approaches to ethnicity. Finally, in Article 4, we will finally look in depth at ethnicity reports – how they come up with their data, what the data means, and how we genealogists – from ALL ethnic backgrounds – can help improve the future of DNA research. In that article, I will also share examples from my own reports, so you can see how data can be interpreted (and misinterpreted) in context.